' [Birth Mother] First Mother Forum: What's the best way to contact your natural/birth/biological* mother? What's the best way to contact your natural/birth/biological* mother? How should a middle-aged individual contact his/her natural mother? The natural mother is in her seventies and lives in a distant state. She is married, presumably not to the adoptee's father, because the marriage took place many years after the birth. To write or to phone? That's the question that a caller posed to me a few days ago. He had recently found his birth mother's information, and was wrestling with how best to reach out to her. Letter or phone? My initial impulse, I said, is to make the call. Because it will be harder to turn you down, I was thinking, even as I hated to think that. Even if she has not been hoping and waiting for her long-lost child to contact her, actually hearing from you on the phone might make her lose any hesitation. If she has doubts and fears, if she has not told those closest to her today, a live person--one's own child--on the phone may dissuade her from... hesitating. From turning away. From rejecting her child. But what if she doesn't answer? What if one gets a recording device? Do you leave a message, and what do you say? Probably not a good idea to blurt out real reason for the call, but if you don't say something provocative, will anyone call back? I guess I would say: I am trying to reach X on a personal matter. Would she please call me at X number? Say you also find out a cell number, but you are not sure who it belongs to--mother or husband? Now what? I can understand any adoptee's fear about making this move. No matter what. No matter how practiced one is at making cold calls, this one is like no other. I'd go crazy. I was faced with some of the same fears when I got my daughter's name, address and phone number. She was 15. It was 1981 and there was a strong taboo against contacting anyone under age. And god forbid--what if she didn't even know she had been adopted? I'd had someone in my apartment a few years earlier pouring out her story about how she found out she was adopted. She and her husband were having a huge argument, she said something about her mother and he shouted back: She's not even your real mother--YOU'RE ADOPTED!! What if my daughter's parents had done the same to my daughter? Not told her the truth about her origins? It was enough to send me around the bend. I got her information on Saturday; I called on Wednesday to a state in the Midwest. My daughter answered the phone, I knew it, she sounded like me. I pretended to be doing a survey for Seventeen magazine and eventually I planned to slip in this question: Do you think adopted people ought to know who their natural parents are? But before I got very far, my daughter handed the phone to her mother--we're both mothers and you know who I am talking about here--who said: This doesn't apply because my daughter is LD. LD? Those are my initials--what was she talking about? My daughter is Learning Disabled? I apologized, and hung up. But I knew I'd go bananas that night if I didn't call back, and so I did. My daughter answered again, and I simply asked for her mother and said: My name is Lorraine Dusky and on April 5, 1966 I had a daughter in Rochester, New York and I believe that she is Jane. As many of you know, in a few moments she was on the phone and a few days after that I met her in the Dane County Airport near Madison, Wisconsin. We had our ups and downs, but I never had to go to sleep again wondering if I would ever find my daughter. But what about the adoptee trying to figure out how best to make contact with his birth mother, who is in her seventies? What does he do? Just writing about this has my stomach in knots because the quandary is great, the pain is so palpable. Adoption as it has been practiced--with secrecy and lies and bad laws--has done so much harm to so many--birth mothers, the adopted individuals, natural fathers, even yes, adoptive parents. How them? the old laws of the past--from 1936 in New York--created a failed experiment in social engineering by telling them that the family of origin would not matter to the adoptee. The Assembly in New York, in a lame attempt to rectify this bad law--passed a pathetic bill this week that was written by the now-gone legal counsel of the corrupt leader of the Assembly now facing jail time. Like a lot of bad laws it is incredibly long and basically makes adoptees get the permission of the birth mother before her name is released. Absurd! My eyes glazed over before I finished reading it. The bill in Albany is the worst law I have ever read regarding releasing the birth information of an individual. Readers--What do you think? What would you do? What should he do? Call or Write? What have you done? * for search optimization reasons, all words that might be used in a search are included here. I just got off the phone with his Albany office. The person I spoke to was familiar with the bill (S-5964 b ) and I was told they have gotten a few calls regarding the bill. Add your voice. 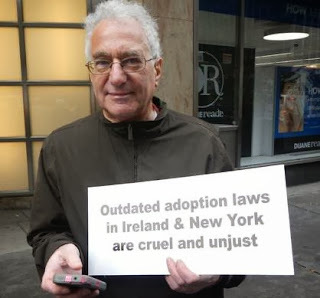 Just say, the Adoptee Rights Bill or adoption bill--they know what you are talking about. Add your voice and explain why. Say you are an adoptee or birth mother in opposition. Say why. "A compelling look at the devastating and long-lasting effects of adoption that reunion alone cannot 'cure.' Vividly illustrates how separation affects not only the mother and child, but all family members and across generations. Natural mothers and their relinquished children, and those seeking such a reunion, would gain from its wisdom and honesty." Sometimes is the perfect word. Nothing comes close to working for everyone. I contacted both of my aunts. Neither replied. yes i agree, there is no one way for everyone. i'm sorry that your aunts were no help :( i hope your situation works out. i only mentioned it as a possibility because it is that, just a possibility, and sometimes it is a good thing to consider more than one or more than the most obvious of possibilities. good luck to you. I guess there are pros and cons no matter which approach you take. I tried both a letter and phone call but neither resulted in any contact with my natural mother. That bill in NY is crazy. How can anyone get the birth mother's permission if they don't know who they are or in my case permission from someone deceased? At this point in time it is more likely than not that the people who don't know are also ones with deceased birth parents. And the ones who do know certainly deserve their birth records as well. I also think the records pertaining to an adoptee who was in foster care before being adopted should be available. I am not sure but would those records be available say if they never left foster care and were never adopted? There are lots of What-Ifs either way. What if he waits too long and first mother is deceased, etc. I suggest that he try calling his first mother and the sooner the better if she is in her seventies. I waited over 40 years for my lost son to find me and finally got a call first from his confidential intermediary. Then I waited 10 long excruciating days for my son to finally call me. Looking back, I would have been thrilled with a letter or phone call. Adoptee should be aware that if contact is made, first mother may be "surprised" and not prepared for the explosion of emotions that may occur. Whether contacting by letter or a call, some risks are undertaken, but some risks are worth it. Hopefully, his mother will be thrilled with being found after the long separation. I do not know the practices for the entire USA, but in general, people who "age-out" of foster care have access to some records, and since they were never adopted, the only birth certificate they would have is their OBC. Their bio-parents are still their parents of record since there was no adoption, so the OBC would show the bio-parent(s) name or names. Other records might also be available, depending on the state. Some of these people remember their original families, and may have had visits with them while in foster care; others do not. I have received requests for search/reunion assistance from these separated family members. Their searches/reunions tend to happen pretty fast. Personally I feel a person to person phone call is best. I would recommend NOT going through family members for two reasons. 1). If she has never told anyone about you. 2). There is a real possibility that other family members were complicit in the separation of you both. I can absolutely say that if contact had come through any of those complicit in the separation OR the 'don't ever talk about it' later crowd, I'm doubtful I would have accepted contact at all. I did tell a family member that if they were ever contacted by my child to immediately give them my phone number and end the conversation right there. I couldn't bear the thought of them having a 'relationship' even a simple phone conversation, until AFTER we had had OUR time (that was taken from us at the beginning) together. I feel family can be so "poisoned" by the positive adoption language that if you were to contact an aunt or uncle or cousin that they may start the 'round robin' of phone calls of "is this a good idea? ", "should we tell HER?" and they have been 'educated' as most of society has been in regard to adoptions. I say this because with us it was my child's father that contacted me. Which was fortunate because he is the ONLY other person I could accept being involved, yet his opening sentence was something to the effect of, "We had a child together, I don't know if you REMEMBER..." Who says that but someone who has been fed the adoption Kool-Aid of, "they(mother) will forget and move on...blah, blah, blah". That was 'ok' though because, well, he is my child's father. I personally feel anyone else BUT the child or in some cases the child's father making contact is an interloper. There were too many coming between us all in the beginning. You don't need more people meddling at reunion because that increases the intensity of the memories of -out of control loss- as at the beginning. Anonymous--I will be writing a post answering your comments. You do understand that I am a mother who relinquished. I am sorry you were not prepared to contacted by your child and are going through such turmoil. Hello Lorraine. Yes, I am aware that you are a first mother. My post was an answer addressed to adoptees, as the title of this blog is a direct question to them. I look forward to reading your upcoming post. Hi Lorraine, I stumbled upon your site today while searching for help to write a letter to my biological father, who does not know I exist. 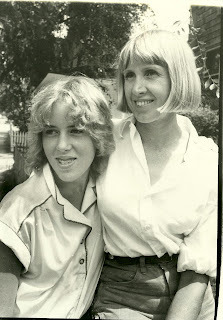 I am adopted and had the good fortune of being reunited with my birth mother 20 years ago. Both the information she gave me and the non-identifying information from my adoption papers, have lead me to find my biological father (with help from Ancestry). But.... I'm at a loss as to how to approach a man who never knew about me 50 years later? My mother dated him for several months and went to college with him. She broke up with him and moved cross country and discovered that she was pregnant with me after she moved. And she never told him. Now I have his address and quite a lot of family information that all lines up, but I need some guidance. Unfortunately, my birth mom died several years back ... I would love to hear from you.